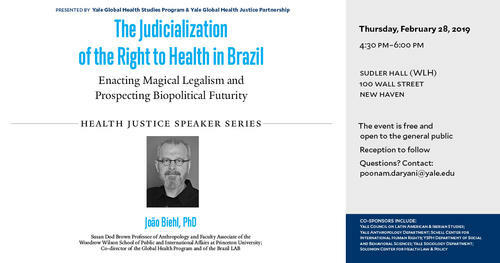 On February 28, Yale Global Health Studies Program and Yale Global Health Justice Partnership will co-host a visit by Princeton professor João Biehl. Professor Biehl’s talk explores grassroots mobilizations for the right-to-health and for state accountability in Brazil, against the backdrop of an expanding pharmaceuticalization of care. Contrary to notions of ‘the end of human rights,’ patients and legal activists are litigating for access to medicines and are rallying for effective infrastructures. As people enact ‘magical legalism’ and affirm an otherwise, they create the conditions of biopolitical futurity.